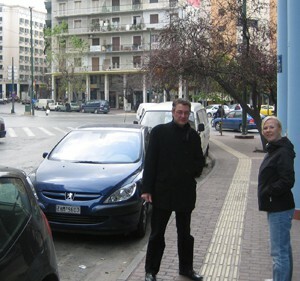 Meet an old friend from Brussels, a wandering “Fin” and visit Athens, the birthplace of democracy (2/2). The hotel foyer was pretty lively in the evening, had free internet, and since you could bring your own drinks, was a pretty cheap/excellent venue for the evening. All the backpackers looked so young, I wondered if I really was getting old. Back to the Polish bar, for a couple of drinks. 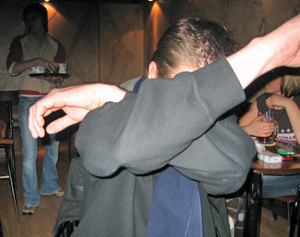 At one point, Paul decides he doesn’t want to be photographed, and does his famous “kung fu arms”. A large figure at the bar kept looking over his shoulder at us. We later realized (when he got up to break up a fight !) that he was the owner, and as his best customers, he was just looking after us. The bar staff seemed very surprised to be tipped. Back to my room to relax and watch some programs on my playstation portable and backup the days photos. 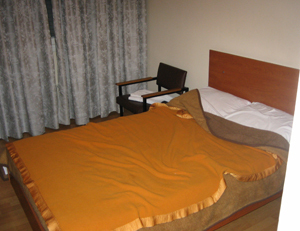 It had a double bed, a “proper” desk and chair and a TV, with the BBC world service (and loads of other programs in Greek). It also had a balcony, although that wasn’t a great deal of use in winter. The following morning, we head out exploring again. The archaeological museum was only 500 meters away. 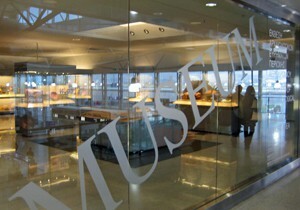 After an earthquake in 1999 the museum was closed for 3 years whilst many of the artefacts were repaired. 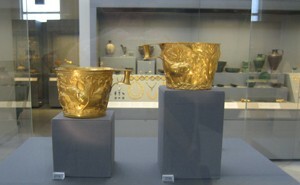 Two beautifully made bronze cups. The glass in the museum was amazing, it looked like it wasn’t actually there, and I had to take this shot especially to show it. 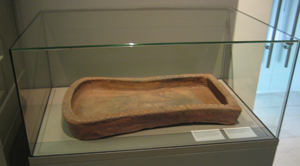 In addition to the exotic artefacts, the museum also featured practical exhibits like this baking dish, used for making bread. 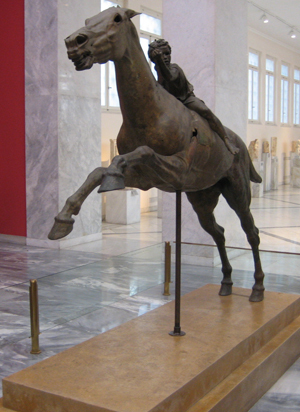 The museum has the largest collection of Bronze statues in the world. 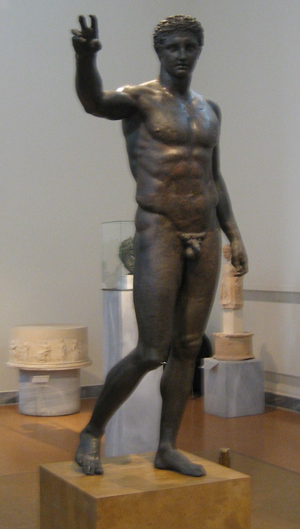 This internationally famous sculpture the Youth from Antikythera. Seven feet tall, it was found in the area of a Roman shipwreck. apparently, the phrase larger than life, comes from statues like this, which were designed to be about 12 inches taller than the subject. Horse and Jockey of Artemision. A horse racing at full gallop, with its young rider clinging to the back. Sculpture isn’t normally my thing, but these to statues were really atmospheric, and you felt like an emotional and physical snapshot of the moment, had been taken by the sculpture. 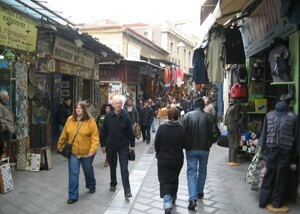 Mia wanted to go and see the Monastiraki flea market.Normally, the area is considered seedy, but on a Sunday morning, it comes alive. There are a number of small jewellery shops in the area, and I notice a lot of Army surplus shops. 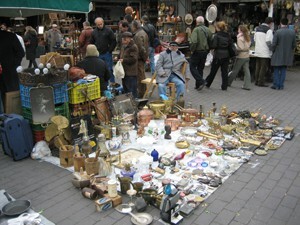 This was the most fascinating market I have ever visited. They had 100 year old working telephones, machine guns left behind by the Nazis after the occupation and just about every kind of useful and useless artefact you could think off. 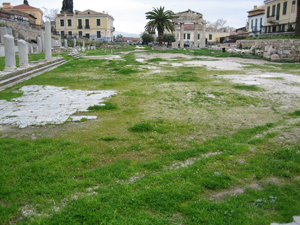 This took over many of the business functions of the Greek Agora, once the Romans had invaded and settled in. There are different symbols on each side, so the direction of the wind will for example position a pointer of an icon of a sailor, signifying good sailing wind. 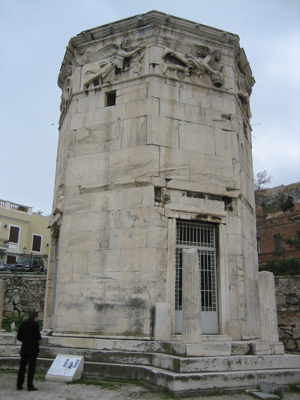 On top, is a fairly complex water clock, and a series of sundials. Built in the first century, it was actually a temple and philosophical center. Although it looked spectacular, all of the seating that you can see, is modern, and only the back wall is authentic. Also, due to some lacklustre placement of fencing, it was practically impossible to get a good shot of it, I was sat on a friends back while taking this !. 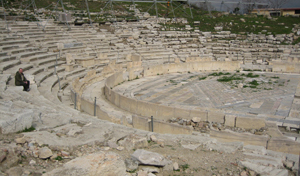 Theatre of Dionysos on the slopes of the Acropolis.When first built, it could seat 15,000 people on simple stone benches. I was delighted that it hadn’t been cordoned off, and that I could sit in it, and be photographed. This will replace the rather small museum at the top of the acropolis. 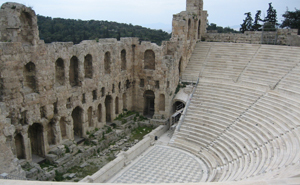 It sits bellow the acropolis, but the acropolis above can be seen through a glass wall. Wasn’t completed when I was there, but during construction a Christian village was found on the site of the foundations. 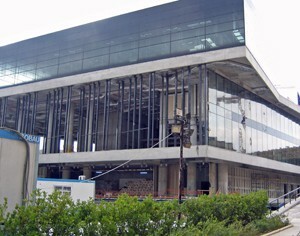 The builders have actually raised the museum above it, with a glass floor, to create a sort of living museum effect. 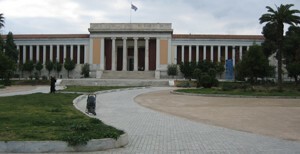 Its intended that the “British” will return the Marbles, now that a suitable museum is available (fine chance !). 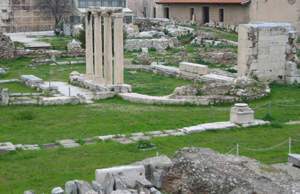 Of the original 104 columns, only 15 remain. This picture was taken through the fence, as the staff, closed the exhibit half an hourly early. For town planners, it must have presented a nightmare, as the 2 goals of keeping the city authentic, but also developing it with a modern infrastructure would have appeared to conflict. 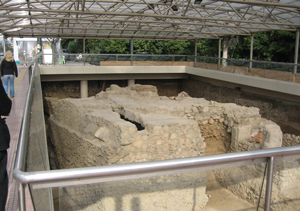 This picture shows one of the solutions they had found, where a busy walkway is positioned around an ancient village beneath. The Grande Bretagne hotel.Arguably the best hotel in Athens, it was used as the German headquarters for 3 and a half years, where Hitler was a regular guest. 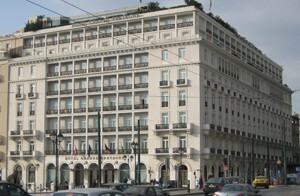 The Greek parliament building in Syntagma Square. 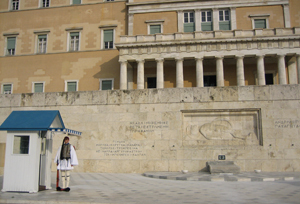 Evzone Presidential guards. Serving in this regiment of only 200 men, is the highest honour a Greek soldier can hold. Shame then, that he has to dress like an idiot, but I wouldn’t want to mess with him !. After an amazing weekend, we head for the airport I bed farewell to my old friend Paul and my new found friend, Mia, wandering Fin. Paul and Mia’s flight was earlier than mine, so I had a few hours to kill on my own. Its the first airport I have been to, which has a museum inside. I spent more than an hour in here, its a shame more airports don’t do something similar.